Countries lived in: India (Belgaum): 1979-80; Japan (Mutsu and Hachinohe): 1983-88; Mexico (Mazatlán):2005-06; Argentina (Buenos Aires): 2006-09; Uruguay (Colonia del Sacramento): 2009-10; Asia (Japan, Thailand, Malaysia, Laos, Hong Kong): 2010-2011; China (Beijing): July 2011 – present. My wife, Maya Frost, and I left the US to give our children a taste of the world outside and to supercharge their brains with new languages, new challenges and new experiences. Maya wrote the book The New Global Student: Skip the SAT, Save Thousands on Tuition, and Get a Truly International Education, detailing our experiences getting the kids — we have four daughters — through high school and college without going the traditional route. Two of them are now working in Buenos Aires and Abu Dhabi. The other two are in New York, one of whom has just completed a couple of years working as a multilingual events coordinator on Norwegian Cruise Lines — she was craving some “land time.” Maya and I have settled in Beijing for the time being. Getting off a plane in Miami after being in South America for two years. It was overwhelming to understand everything that was going on around me. All the magazine racks were screaming that I was too fat, too old, too poor and too poorly dressed. I wanted so much just to get back on the plane and go “home” to Buenos Aires. The longer I stay out of the US the more this is happening. The “normal” feeling for me now is to feel displaced. Not understanding the language, not feeling like one of the crowd, not recognizing anything on a menu — that is when I feel at home. My wife and I are obsessively light travelers. Even when moving to a new place to live for an extended period of time, we never have more than one carry-on each. I am a firm believer in the old adage that “you don’t own stuff, your stuff owns you.” I have a compass that was left to me by my father and about 30 photographs (unframed) of our family — we buy new frames each time we set up a new home. Beyond those items we take nothing more than a few changes of clothes and our laptops. Let’s start with the drinks because they generally taste the same each time they come out of the bottle, unlike my favorite meals which are those have not yet tasted. A bucket of iced Mexican Pacifico [a Pilsner-style beer] for the appetizer, chilled sake for the cold course, a hearty Uruguayan Tannat for the main, Argentine fernet for dessert — and a couple of Tylenol for a nightcap. My current craving is for shrimp Chinese dumpling, purple cabbage and cucumber in a spicy chili sauce, with cut chives for garnish. How does that sound? My ability with languages is less than stellar so I’d prefer to loan you a few body language motions. From Japan: Sucking air through gritted teeth and turning your head to the side — this means you are giving something a great deal of thought but also buys time to figure out what what was just said. Even if you cannot come up with a reply, you get points for showing you are thinking hard about the subject at hand. From India: The head bobble — it can be construed as an affirmation but is ambivalent enough that you can later change your mind and renege on whatever you agreed to. It is also fun to practice in the mirror for your own amusement when bored. I dislike traveling without arriving. There are certain things I immediately look for in any destination to make me feel at home, but in reality, it is silly I look for them — why bother traveling if I want to feel at home? I definitely lean more toward the rational mindset. I love getting to know transportation — specifically, bus routes and subways — as well as getting a handle on how traffic patterns have developed over time. As a child of the US suburbs, I used to equate riding public transportation with being a loser, but now I know it is freedom. And it’s not just rational, it can also be “in the moment.” Life happens on public transportation — the grateful glance from an elderly woman you give up your seat to on a subway in Tokyo, the giggles of the small child you play peek-a-boo with on the train in Kuala Lumpur, the strains of the guitarist serenading bus riders on a Friday afternoon in Buenos Aires. Nothing interesting has ever happened to me by myself in a car. img: Tom Frost becoming displaced yet again — by an elephant in Pai, Thailand (June 2011). STAY TUNED for tomorrow’s installment from our displaced fictional heroine, Libby, who is just back from a road trip with Oliver and Jack, during which she has pondered her new life and the Melissa situation. What, not keeping up with Libby’s expat adventures? Read the first three episodes here. 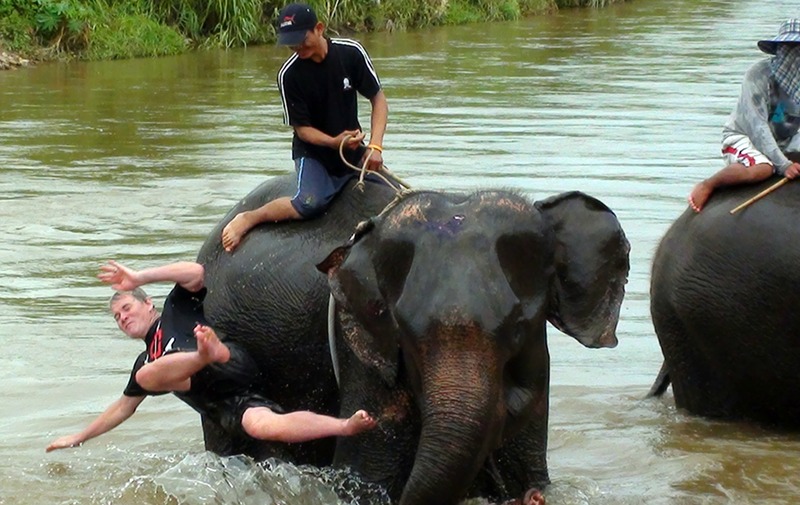 I am sure that is the very same elephant that threw me into the river up in Pai !!.. a 100% yes in my book ! I love the interview and I believe Tom is having the time of his Life !! Seeing a 7/11 is comforting though I hardly ever go to them–I just like knowing there is a back-up. I met people in Japan and in Thailand who thought 7/11 was both a Japanese chain and a Thai chain so I am not alone in feeling they are a “home brand”. I look for people walking along the street with bags of food and a healthy interaction of pedestrians, cars and buses. Sharing is more important than staying within the lines. Diversity in architecture is key. I am OK with ugliness as long as it looked like the designer tried. Old, new, beautiful, wacky, big, small–to me this implies that the place is creative and gives me hope I will have some fun exploring ahead of me. Oddly enough, none of the above is typical of my former home in the US. BTW, what kind of residency requirements do you have for The Displaced Nation? I have to admit, I share your instincts on convenience stores — especially in Asia. My husband and I were in Jakarta last November, and I breathed a sigh of relief when I noticed the 7/11 on the same side of the street (crossing the streets in that city can be a bit “hit or miss”). And I’m so glad you mentioned creative architecture. After living in Tokyo — home of the exotic skyscraper — I came to think that most cityscapes are better off with the occasional wacky effort. Finally, thanks for asking about TDN residency requirements. I’m aware these Random Nomad interviews can be somewhat intimidating. As when making an application to a Manhattan co-op board, try as you might to hit the right buttons, you can never be sure of approval. Still, as your question implies, it’s only fair that we issue a few guidelines about what kinds of people we’re looking for at The Displaced Nation. Here’s my shortlist — others may wish to add to it? 1) You are one of the few people in your immediate family to have become “displaced” — so would appreciate the opportunity of citizenship here. 3) You like to collect wacky objects from countries where you’ve lived, which have meaning only to you and no one else. We welcome displays of these objects here. 4) You’re a bit of a foodie — and have collected dishes that you like eating from these places as well. Citizens of The Displaced Nation are adventuresome eaters and would love to be your dinner party guests. 5) You collect words/expressions from the countries where you’ve lived — and sometimes use them as there’s no exact equivalent in your native tongue to describe particular emotions. Citizens of The Displaced Nation are always struggling with cross-cultural communications and so are eager to find out what has worked for you. You, Tom, pass muster on most of these items except #3. You’re not a collector. Still, I’ve decided I admire you and Maya for your minimalist practices. I’m also partial to anyone who’s ridden an elephant (in my former blog, I described the impulse to venture across borders as “seeing the elephant”). Yes, following Tom and his adventures has kept us going as well. Struggling to get my head around the concept of moving countries with just a carry on bag. For being able to do this, Tom deserves the key to The Displaced Nation.